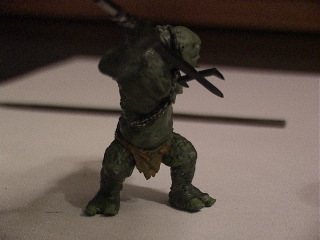 How to paint the Cave Troll with Spear! So your buddy has some pesky Hobbit models that just keep getting in your way, show them who's boss with the Cave Troll, which we will show you how to paint here in our new weekly segment that'll show you the ins and outs of model painting. First we have to get our model cleaned, and glue it together, making sure we don't cut off the tab on the Trolls foot as that will be what holds him to his base. Now that we have our fully assembled Troll, we get to take him to a well ventilated area and spray him with a light coat of black spray paint. You can use white, but for a dark model like this, I prefer a dark undercoat. 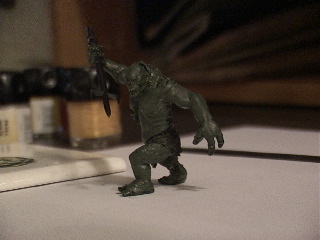 You want to make sure you let your Troll dry completely before continuing, I recomend for a model this size to leave it sitting for at least a half hour in a well lit room. 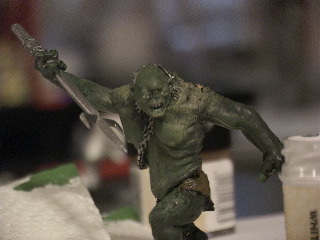 Now take your brush and mix together a small bit of Goblin Green, and about twice as much Chaos Black to get a good deep green color, go over the entire troll making sure not to over paint the details of his back, this will give us a very clean deep green color, before we add the dirt and age of our Moria friend here. 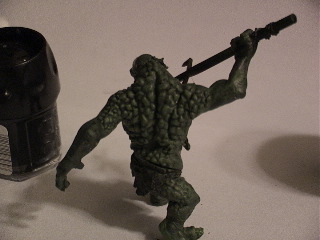 Your Troll has very bumpy skin on his back, you'll want to paint a lighter coat of green on these bumps to add a deep shadow between each bump, this dry brushing technique will come in handy throughout this demonstration. 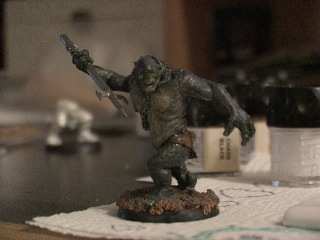 The Troll's loin cloth can first be painted with a coat of Snakebite Leather, then followed with a light coat of Bestial Brown to give it a dirty used look. 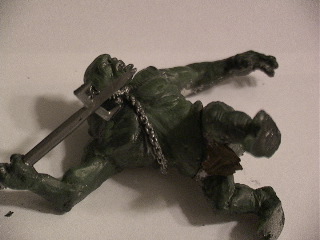 Now go ahead and paint the chain very carefully with Boltgun Metal, and follow that with his spear with the same color. You can also detail each bit of the buttons and metal bits of his loin cloth. Now we'll toss a very tiny bit of paint into the gaps that are the Troll's eyes, and drop a small dot to represent the trolls pupils. Then add a thin coat of white to the Troll's teeth making sure to leave enough of the undercoat showing to indicate that this Troll was not a Crest Kid. 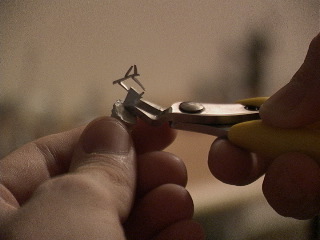 Now comes one of the most rewarding parts of your model, the terrain! 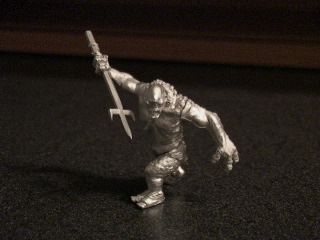 Take a good portion of Bestial Brown and cover the entire base making sure to leave the hole uncovered for the Troll's peg. Now dip your base in terrain sand and let it sit and dry the sand to the base. I like to drop a few drops of super glue over this base to make sure the rocks and sand stay in place. Now come the final details to your cave troll, take your Elf Flesh and drybrush that under your Trolls skin, and on his chest to show the warn flesh. Now take a small bit of Ultramarines Blue, and Bone White, and mix it with twice the ammount of Chaos Black, this should give you a good blue tinted grey to apply to dry brush all over the skin of your Troll. This will give him that look of a Troll who's been living in the mines putting up with screeching Moria Goblins. Now just toss a light coat of Bestial Brown onto the sides of the figures base, making sure not to get any paint on your terrain sand. That's it! 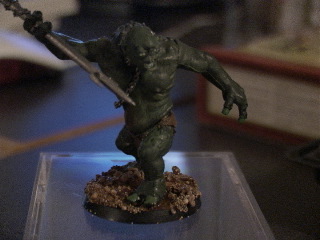 Your Cave Troll is now ready to make a Frodo-cabob and show your friends who commands the forces of evil!